Maja Gunn is in the exhibition Museum of Artistic Research at History Museum, Stockholm. www premiere of Peach Punch. Film by Cissi Efraimsson. Costumes Maja Gunn & Lisa Pyk. Premiere of Peach Punch at Bio Rio, Stockholm. Film by Cissi Efraimsson. Costumes Maja Gunn & Lisa Pyk. Maja Gunn in the Swedish podcast Konst Form. Maja Gunn’s work is in the exhibition A Queen Within Adorned Archetypes at NOMA, New Orleans. Opens to the public on February 21st. See Maja Gunn’s work together with pieces by Alexander McQueen, Comme des Garçons, Maison Martin Margiela, Iris van Herpen, Gucci, Gypsy Sport and more. Until May 28th 2018. Opening of Maja Gunn’s solo exhibition Play at the Textile Museum, Borås. November 11th 1pm-3pm. Maja Gunn talks about Norm Form in Swedish Radio’s Kulturnytt. Maja Gunn is in SVT Morgonstudion talking about the exhibition Norm Form and how craft, design and architecture can confirm and/or challenge norms. Book Release of 2nd edition of Maja Gunn’s Body Acts Queer: Clothing as a performative challenge to heteronormativity. Maja Gunn is the curator (together with Camilla Andersson & Karin Ehrnberger) of the exhibition Norm Form at ArkDes, Stockholm. 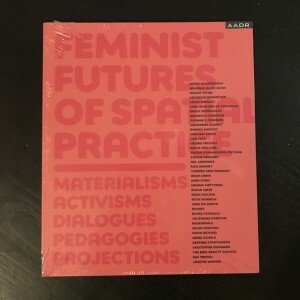 Feminist Futures of Spatial Practice: Materialisms, Activisms, Dialogues, Pedagogies, Projections (eds. Schalk, Kristiansson, Mazé, 2017) is now available. The publication contents text and images about Exclude Me In (a collaboration project by Maja Gunn, MYCKET and The New Beauty Council) and much more. 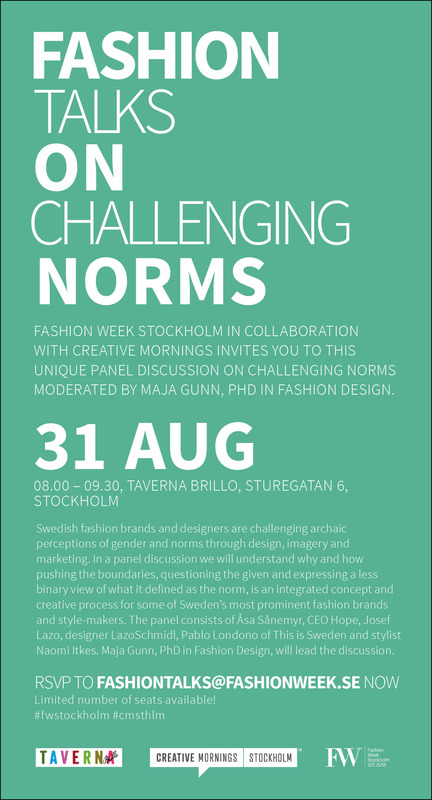 Maja Gunn is the moderator for a talk entitled Fashion talks on challenging norms. Maja Gunn is part of the exhibition A Queen Within Adorned Archetypes at Art Basel Miami. Includes works by Maja Gunn, Iris Van Herpen, Vivienne Westwood, Hussein Chalayan, Rick Owens and more. Maja Gunn & Saga Becker will talk about queer, performativity, identity & creativity. Maja Gunn talks with Kakan Hermansson about feminism and sisterhood as survival strategy. Baby, by director Lovisa Sirén (costumes by Maja Gunn) is screening at the Swedish Television. Maja Gunn exhibit at Textile Museum in Borås. Until August 14th. Elliphant’s music video Club Now Skunk (director Johan Holm), styled by Maja Gunn and Stina Persson Helleday is nominated for a Swedish Grammy in the category best music video. Maja Gunn talks about her work and about the exhibition Utopian Bodies – Fashion Looks Forward, with the curator Sofia Hedman. The film Audition by Lovisa Sirén (costume by Maja Gunn) has its premiere at Gothenburg Film Festival. The film Audition by Lovisa Sirén (costume by Maja Gunn) is the opening film at Gothenburg Film Festival. Maja Gunn is the moderator for a talk about Fashion and the narrative of the body with Efrat Tseelon, Robert Fux and This is Sweden arranged by Iaspis and Fashionplay. @ The Shorts Movie Channel this month! Maja Gunn made hats for Suzanne Osten’s Lammungarnas Fest at Unga Klara, Stockholm City Theater. The seminar is open to anyone who is interested, and it is perfectly alright to bring lunch to the seminar. The project Maja will present, Body Act Queer, is a queer feminist investigation into design as politics, bodies, identiy, and norms. She works from an extended definition of the term design in where it not only include artifacts (i.e. clothes) but also the creation of ideas and where design so becomes a notion of ideology and social change. Maja Gunn talks about her work in the Swedish Radio Ekerö. The film History As We Know It is now up. The film shows the mixed archive materials of the Göteborgskarnevalen with the queer carnival Maja Gunn, NBC and MYCKET created in September. It is a rewrite of history to make the future belong to us. Maja Gunn is together with The New Beauty Council and MYCKET in the magazine Glänta’s special carnival issue. Maja Gunn participate together with Mariana Alves in the Magazine release and artist talk at Tensta Konsthall, Stockholm. 6-9 pm. 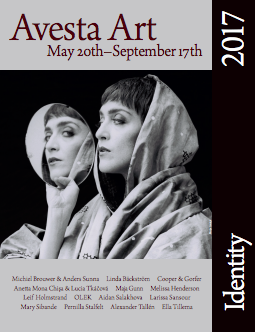 Maja Gunn is in collaboration with The New Beauty Council and MYCKET doing a performance in the centre of Gothenburg as part of GIBCA, Gothenburg International Biennial for Contemporary Art. Starts at Esperantoplatsen at 5 pm. Release for Maja Gunn’s publication “If you were a girl I would love you even more” at Bonniers Konsthall. Free and open to the public. The bar opens at 5 pm. At 6.30 pm Maja Gunn will do a reading followed by a talk between Maja Gunn and Louise Wallenberg. The evening ends with a performance by The Sweptaways. Wednesday July 4th 6pm-9pm, Babylon, Björns Trädgård Stockholm. Just Like Zorro/ Som En Zorro – winner of both Jury and Audience Award at Gothenburg International Film Festival- will be shown at SVT, The Swedish Television on Wednesday June 20th at 9.45 pm. Maja Gunn is part of the exhibition FashionPlay at Arkitekturmuseet, Stockholm. The clothes are also visible in a webshop. Just Like Zorro (Som En Zorro) is showing on the Swedish Television. Swimming Away has its premiere at Lisboa Film Festival. MacArthur Dance Project performs at Edinburgh Festival Fringe, Scottland. Release for Ful – The Book. Maja Gunn writes about Collection L.
Maja Gunn designs costumes for the Dance Performance »From the Margins, This, Unmentioned« at Brooklyn Lyceum Oct 15–17th. Performed by MacArthur Dance Project. Choreography by Bronwen MacArthur. Music by Bryan Senti. Maja Gunn shows a collection with House of Organic at green New York Fashion Week. Maja Gunn participates in the exhibition and open studio event Stockholm Fashion Walk. The film The Woman Without Qualities has its premier at Bio Rio, Stockholm. The film The Woman Without Qualities (Kvinnan utan egenskaper) by the Swedish artist Kira Carpelan is shown at Svarta Havet, Konstfack, Stockholm December 5th 2008 1pm–4pm. Maja Gunn is styling costumes for Freedom Shelter – a music and dance performance in New York November 11 2008.
at Röhsska Design Museum, Gothenburg. Stockholm until January 6 2009. Maja Gunn participates in the publication Delta. Release at Färgfabriken, Stockholm. Opening of the show Kira Carpelan by Miriam Bäckström at Färgfabriken Stockholm. The exhibition contains the film Untitled.